Hair growth occurs from the inside out and relies heavily upon the health of the body as it uses the body's energy, vitamin and mineral supplies to produce approximately 0.35 millimeters of growth per day. Inadequate amounts of certain vitamins and minerals may lead to sparse and slow hair growth, according to The Vitamins and Nutrition Center. Adequate amounts of the needed vitamins and minerals, on the other hand, result in strong and healthy nail and hair growth. Oral vitamin E increases blood circulation, thus improving the amount of blood flowing through the hair and nail-growth structures. Your nails and your hair are both created from dead keratin cells. The dead cells accumulate as a result of activity in the hair and nail-growth structures. The activity, consisting of cell formation and division, would not be possible without an adequate blood supply. An increase in blood supply increases growth efficiency and may lead to faster, stronger and healthier hair growth. According to The Vitamins and Nutrition Center, any nutritional deficiency can play a contributing role in hair loss and thinning. Blood circulation naturally becomes more sluggish with age. 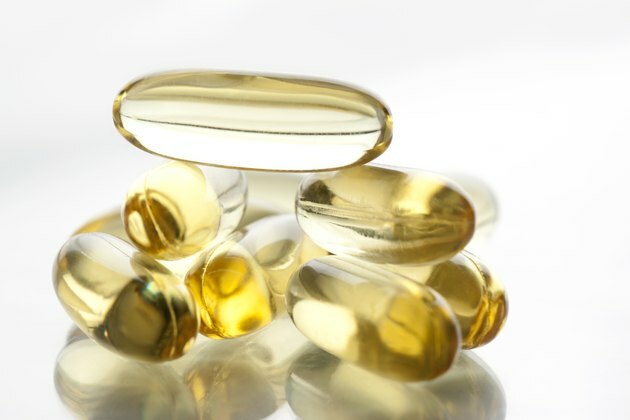 To combat the effects that this slow down has on hair and nail growth, certain oral vitamin supplements, including vitamin E, can increase the amount of vitamins available in the blood stream. This allows the growing components of hair and nails to absorb more of what they need. Vitamin E, in a topical liquid form, can help correct certain nail-growth disorders and problems, including yellow nail. In this condition, nail growth takes on a yellowish, thickened appearance. In addition to topical treatment, oral vitamin E supplements have also been effective at treating this condition. Yellowed, thickened nails can also be a symptom of a fungal infection. Consult your doctor before self-treating this condition. The recommended dietary allowance of vitamin E is 15 milligrams, or 22.4 international units according to the National Institutes of Health Office of Dietary Supplements. Food sources of vitamin E include wheat germ oil, nuts and seeds, corn oil and boiled spinach. Excess vitamin E intake may cause internal bleeding and increase your risk of stroke. For this reason, the Food and Nutrition Board has set the upper tolerable safe intake limit at 800 milligrams or 1,200 international units.